“You know what to do with it.” Photo credit: DonkeyHotey / WhoWhatWhy (CC BY-SA 2.0) See complete attribution below. But instead of a silver bullet, it’s more likely that the tax returns will be a relative dud, and here is why: There is simply no way that they are complete and accurate. All of that is small potatoes compared to the pattern of “dubious tax schemes” that the New York Times uncovered last year in an excellent article. These practices — some of which, experts believe, were downright fraudulent — resulted in Trump’s father, Fred, evading taxes and gifting his son hundreds of millions of dollars. Just this week, in an effort to ward off judicial misconduct proceedings triggered by that investigation, Trump’s sister, Maryanne Trump Barry, retired as an appeals court judge. And she is generally viewed as the least corrupt of the clan (aside from the president’s 13-year-old son, Barron, and his youngest daughter, Tiffany). The point is that Trump, backed by an army of lawyers like Michael Cohen, has engaged in tax fraud, various illegal schemes, and swindles for a very long time. And, for the most part, he has gotten away with them, apart from some slaps on the wrist. Add to that the president’s historic propensity for lying and you see why we are skeptical that Trump’s tax returns will provide further proof of things we already know: The president is a crook, and the rich get away with defrauding the government because their lawyers know how to abuse the tax code. While millions of Americans are spending this weekend diligently and honestly filling out tax forms, the 1% are sitting back and letting their attorneys take advantage of loopholes written in the tax code specifically for their benefit. The president’s returns will likely also demonstrate that Trump is trying to convince the IRS that he is a lot less wealthy than he is publicly claiming. That’ll be the extent of it. Because he may be corrupt, but Trump is no idiot. He has successfully operated as a conman and convinced nearly half of all Americans that he is a successful entrepreneur and self-made billionaire. There is certainly no reason to expect that the returns will show whether Trump helped Russian oligarchs launder money, or whether the president’s own financial ties to Saudi Arabia are dictating US policy in the Middle East. More importantly, nothing in the documents will change anybody’s mind about the president. Now, don’t get us wrong: We’d rather see the tax returns made public, because it will, once again, show the world who Trump is (at least the people who didn’t vote for him). We just don’t think they will be a massive game changer. 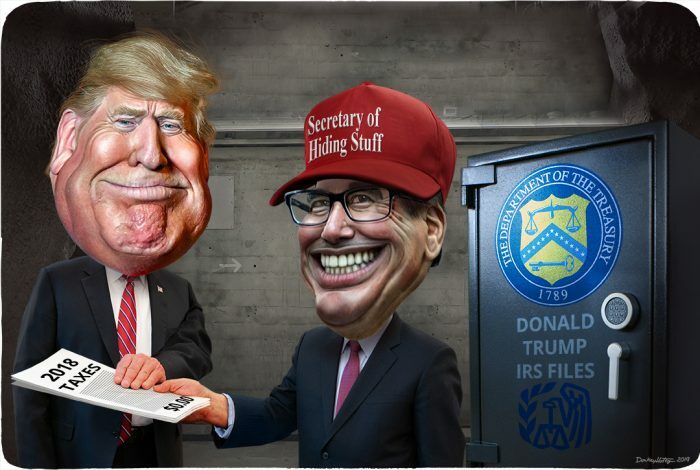 The cartoon above was created by DonkeyHotey for WhoWhatWhy from these images: Donald Trump caricature (DonkeyHotey / Flickr – CC BY 2.0), Steven Mnuchin caricature (DonkeyHotey / Flickr – CC BY 2.0), bodies (The White House / Flickr), safe (Sandra Hässig / Wikimedia – CC BY-SA 4.0), US Treasury seal (US Treasury / Wikimedia), IRS logo (IRS / Wikimedia), MAGA hat (Gage Skidmore / Flickr – CC BY-SA 2.0), and background (Kecko / Wikimedia – CC BY 2.0). Related front page panorama photo credit: Adapted by WhoWhatWhy from 401(K) 2012 / Flickr (CC BY-SA 2.0) and The White House / Flickr.